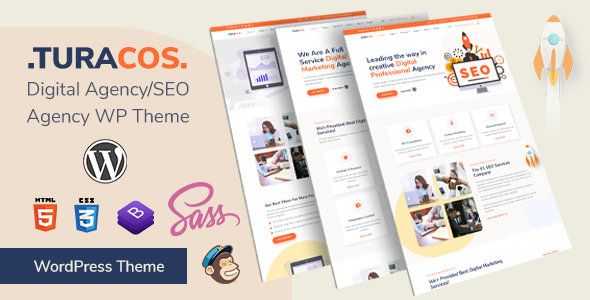 Turacos is a Bootstrap 4 based creative professional WordPress theme. This is created for marketing agencies who provide Digital Marketing, SEO, SMM, and SEM services for the clients. Also, this theme is suitable for Mobile App, Software, Startup, WebApp, SaaS, and any other business agencies. The Turacos responsive WordPress theme will help to publish the digital agency’s services with portfolios best as possible to the online. The theme has multiple variations for almost all pages and the UX/UI looks stunning on all device types. Also, this theme is coming with one click demo import ability, well commented and easily customizable source code with detailed online accessible documentation. All of these features will help to make the theme use and customization based on business needs. Images are only for demo purpose and not included in the download bundle, but if the customer import demo data then he/she will find images.